Fuchs' music is not a completely new quantity to this listener. CDs from Thorofon (review ~ review) and Hyperion (review) introduced me to a composer whose music resembles that of Brahms. It’s a pleasure to hear but does not score high in the originality stakes. Its innate apollonian delights more than compensate for its failure to find a revolutionary soundworld. The ideas are fresh, well-shaped and cogently presented within a broadly Brahmsian perimeter. For years this Styrian-born man was a lauded figure in Vienna's musical world. His name subsisted after his death as a teacher of Wolf, Schreker, Mahler, Sibelius, Zemlinsky and Richard Strauss but his own music is not negligible. The First Symphony, like its successor, is in four movements. It is a blithe work; especially so in the chirpy finale which in mood might be a sibling of Dvorak's Eighth. Of Brahms' four symphonies it is of a piece with the Second with some glances at the First. 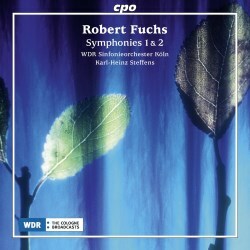 Fuchs' own Second Symphony surges with a more heroic Egmont-style mien than the First. Among the Brahms symphonies it can be counted alongside the Fourth. It has a particularly gracious and silvery Menuetto third movement. In the finale Fuchs returns to the Weber-like energy and Beethovenian tempests of the first movement. There is a Third Symphony dating from 1907 which can be had as a download from the American Symphony Orchestra conducted by Leon Botstein. No doubt CPO and Steffens already have it 'in the can'. CPO have also put on record Fuchs' fiery and craggy Piano Concerto (review) with all its echoes of the Brahms concertos. These two charming works of the 1880s are imbued with tension and sparking life by the WDR orchestra and by Karl-Heinz Steffens. The recording lays bare the musical strata without being too hygienic. Eckhardt van den Hoogen's lengthy liner-note is in German and English. It adds valuably to the package and does not suffer from the abstruse philosophical obscurity that has afflicted other CPO essays.